I designed this scarf pattern for our very awesome Dog Trainer, to match her green eyes. She has helped us tremendously in connecting with our puppy, as well as gaining respect from and for Sam. We have a long way to go, but it sure is fun! Gauge: 4 stitches x 4 rows = 1"
First and last stitches are the edge stitches - these are always knit, on the wrong and right sides. You can block this scarf if you'd like. It didn't work too well with the yarn I used, so the edges curl in. 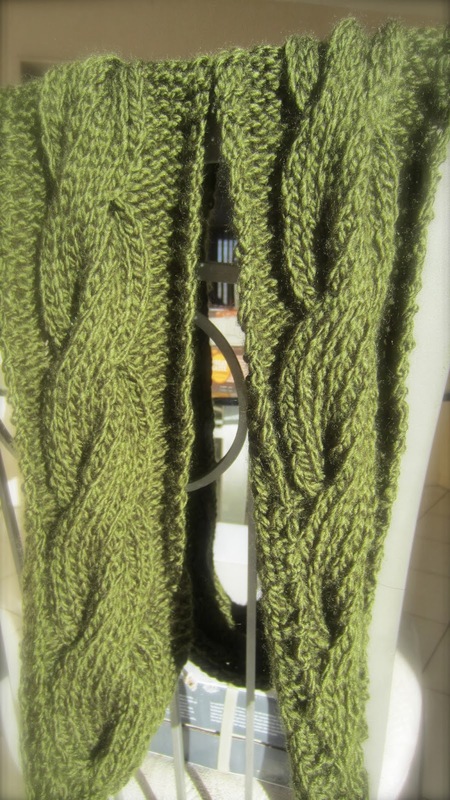 Knit these 12 rows for a total of 6' or your desired length, then bind off. 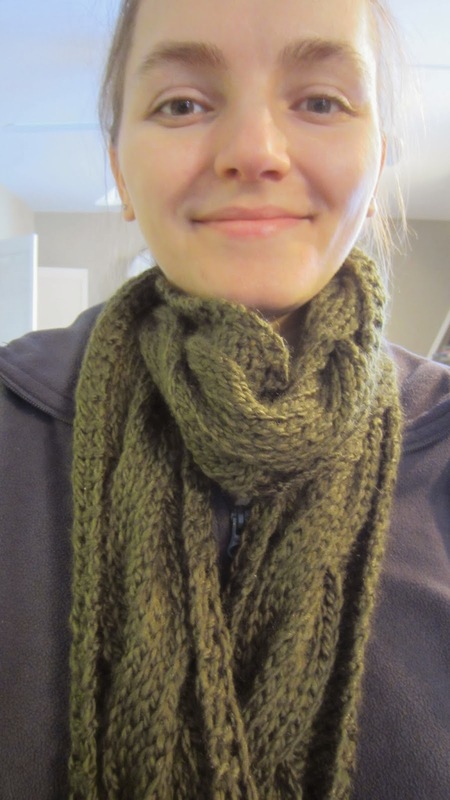 You can also attach the two ends and make it a cowl. This bind off is super stretchy. Knit the first two stitches, put them back on the left hand needle, knit those two together. 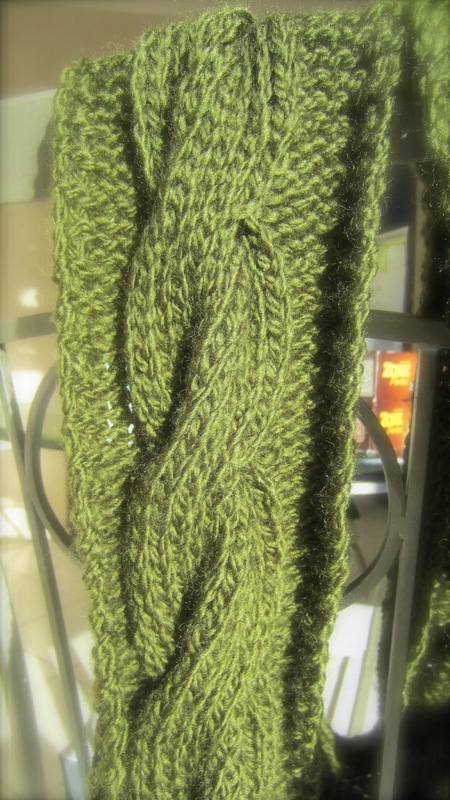 *Knit the next stitch, put the two from the right hand needle to the left and knit those two together. Continue from * to the end. Pull yarn through the last loop and cut. Weave in ends. Now, wasn't that easy? Once you get the rhythm, you can start knitting mindlessly - but be sure to keep track of your rows! I use a sticky. 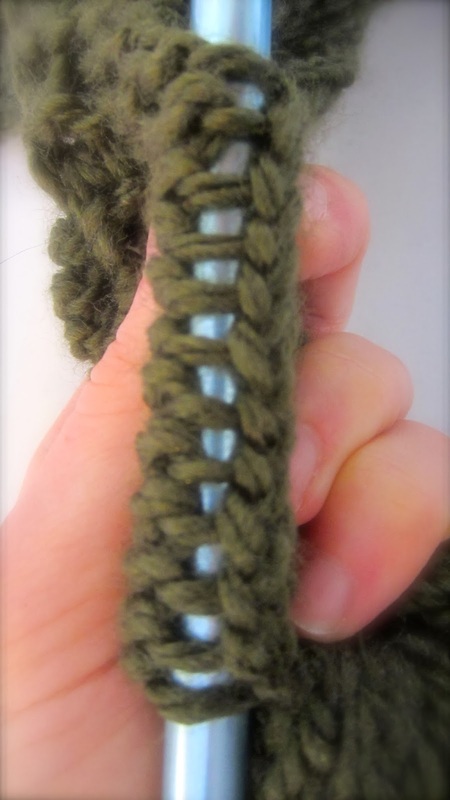 You can also stick your needle between the cables and count the ridges to make sure you have the right number of rows (in this case 12. Please let me know who you would like to make a scarf for and I will come up with a unique pattern for them. Just message me to the right of your screen in the "Contact Form." Be sure to include a little bit of background about this special person!